One of the best ways to start your day is with a free newspaper delivered to your door. 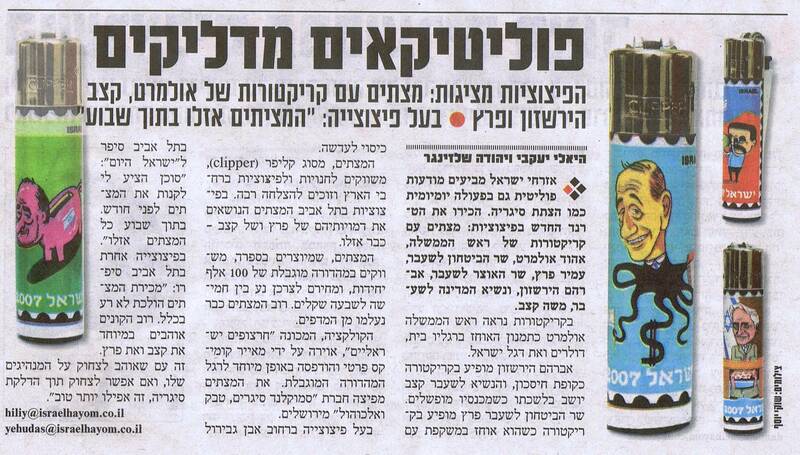 It all started about a month ago when the newspaper, Israel Today, appeared at my door step with no strings attached. At first I thought there was a mistake. Then I noticed all my neighbors had them too. Since then the paper continues to be my favorite part of the morning, a Hebrew challenge and taste into the news of real Israelis- no offense to Jerusalem Post readers. Most days I read all the headlines and then test myself with a cultural article. Today I chose an article that I wanted to share with everyone. You can tell from the picture what the article is about: the latest trend of lighters with political caricatures. Each lighter depicts our favorite current politicians, from Prime Minister Olmert to former president Moshe Katsav. Reading this article made me realize that not only do I get my dose of Israeli culture but I am finally becoming part of it. Laughing at these lighters lets me know that I am on the inside of the joke. No more awkward laughs, I truly understand why Katsav has his pants down and that makes me happy. And since I am feeling so confident in my Israeli cultural-ness, how about I add to the joke. Why not take the same cartoons and put them on toilet paper. You get it? Then every time you…well I think you’ve got enough “culture” to figure that one out. I just hope they sell them in bulk! "Lighters with a little light humor" was written October 25th, 2007	by thebigfelafel, and filed under Easily Amused and tagged Posts by Molly.